Welcome to Kryptaglow Superior Glow In The Dark Paints! Welcome to Kryptaglow Superior Glow In The Dark Paints & Products! We extend our hearts and sympathy to everyone impacted by hurricanes Harvey, Irma and Maria. Our thoughts are with you in these difficult times. 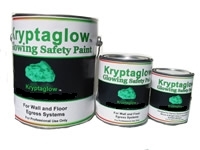 KryptaGlow Glow In The Dark Paints can be used in every facet of your Business or Home. From lighting the escape pathway markings of a Darkened Building to lighting up your Backyard without the use of electricity. Click Here for the new laws adopted into the IBC on 1, October 2008. 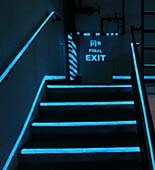 If your looking for the best Glow in the Dark Paints, Exit Signs, and Egress Strips for the new Material Equipment Acceptance (MEA) LL26 codes in NYC, or “Glow in the Dark Paints and Safety Products” for your home, business or a 75 story skyscraper you have come to the right place. Also available are Glow In The Dark Paints, both solvent & water based, 2 Part Marine Paints Please review our products under the product button. WARNING: Glow in the Dark Tape is Dangerous! As the top manufacturer of glow paints for the safety industry, we hear all the time that glow in the dark tape is the worst product and actually comes off in a day in some cases. Recently we welcomed a new customer who installed tape on a banister and it cut people’s hands as they were going down the steps. Click here to see pictures of what happens to this tape soon after application. Firemen report that the blue color of our Kryptaglow Special Blend MEA Glow In The Dark Paints is easier to see in a fire than the yellows and greens of less reliable products. Yellow and green disappear in the reds and yellows of the fire. 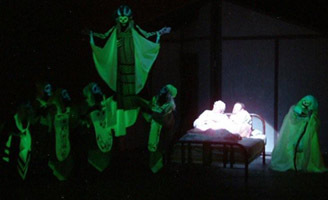 KRYPTAGLOW® SAFETY GLOW PAINTS are designed for professional use in industrial applications and for Egress Systems for evacuation, or anywhere Photoluminescent Paint is needed to light up dark areas. 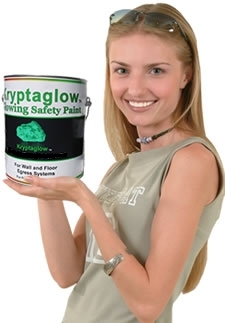 Kryptaglow® paints can be applied to walls, floors, metals, or on just about any properly prepared surface. Last year, the International Code Council (ICC) approved two changes to its International Building Code (IBC) and its International Fire Code (IFC). 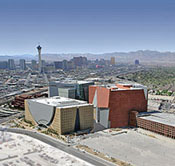 The first requires pathway marking systems in new high-rise buildings and the second requires pathway marking systems in existing high-rise buildings. The requirements apply to the following occupancy types: assembly, business, education, institutional, mercantile, hotels and motels etc. KRYPTAGLOW® meets the new codes that have been developed and are being enforced Such as ASTM E 2072, UL1994 and NFPA 101 elevating the standards for brightness for egress systems. 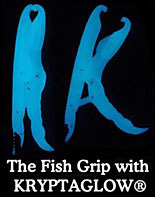 Kryptaglow® has glow in the dark paints for every professional use. KRYPTAGLOW® glow in the dark paints are available in Latex Water base, Solvent base, Marine Epoxy, Acrylic Enamel, and Poly Urethane for vehicles. 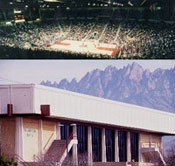 KRYPTAGLOW® is a system of 3 coatings. Proper application; White bottom coat, Kryptaglow® Safety paints, then Clear Top Coat. KRYPTAGLOW® SPECIAL BLEND MEA Paint Kit This paint passes all safety test for certification for new IBC Codes, UL 1994 and ASTM E 2072 standards and has the numbers to prove it. It comes in a kit which has ½ gal of bottom coat 1 gal of MEA paint and 1 quart of top coat to seal it. This is the very best money can buy and the brightest. It is the only top coated paint to have the standards saving you money by protecting your investment and lasting for years. You can also make EXIT signs with the Special Blend System which pass UL1994 requirements. KRYPTAGLOW® WHITE Base Coat We have formulated a White base coat for use with all Kryptaglow® Safety paints. KRYPTAGLOW® MARINE There is always a need for tougher hard skin paint for machinery outdoors and area where moisture may be a factor. We currently have this paint made in our SUPER formula for an outstanding glowing effect. It will set in 3 hours. KRYPTAGLOW® PLASTIC DIP Formulated for dipping tools, handles, or any surface where a plastic glowing coating is needed. It can aid in preventing surface scratching between two metals. KRYPTAGLOW® coatings have been used in applications for Marine, Aviation, and Military. Beware of imitations! – There is no substitute for quality! If it does not say Kryptaglow its not the best! Glow In The Dark Light Fixture Strips Light Your Way to Safety! Designed to attach to most fluorescent light fixtures with included magnets. These strips can perform for 15 to 20 years.